The Nigerian Army's Plan To Set Up Grazing Lands Is Another Attempt By The Fulani Islamic Caliphate To Take Over Our Homelands. The Fulani caliphate has never given up on the mission of overrunning and occupying Biafra. They had failed to use Fulani-herdsmen attacks and demand for grazing lands, by the MACBAN and their associates at the national assembly, to take over strategic locations in our homelands. This time, they are going through the Nigerian military. They want the “army” to set up grazing lands all over Nigeria and the territories of Biafra. What does a cattle grazing got to do with the military? Has cattle breeding suddenly become “protecting the territorial integrity of the country”? It's only a person who is not informed on the Fulani empire's desperate desire to dominate us that will not see that the Nigerian Army's plan to create cattle grazing lands on our lands is another attempt by the Fula empire to overrun us. 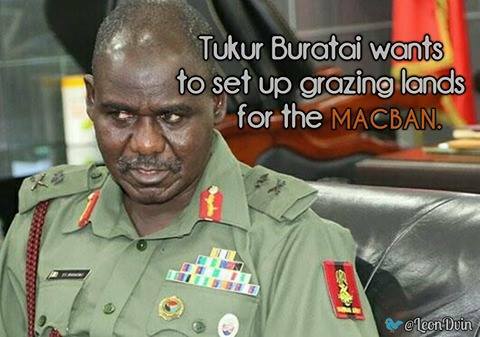 With Lieutenant-General Tukur Buratai: a corrupt and murderous Fulani supremacist, as the Chief-Of-Army-Staff, even as we did not give in to Fulani-herdsmen attacks and hand them over our lands, and the national assembly failed to do that for them, the Fulani caliphate may still grab our lands using the army. There's already a special military unit dedicated to Fulani herdsmen called “anti-cattle-rustling taskforce” on standby. What the Fulani caliphate will now do, using military intimidation, is go into our farmlands; stake out and appropriate the portions of land of their choice “no questions asked”; and deploy the Fulani herdsmen/militants therein. Mission accomplished! The next step: the Fulani militants, along with the “military taskforce”, will then launch coordinated terror attacks on us with much ease and at will. Recall, the Nigerian army is a member of Saudi Arabia's Islamic Military Coalition, therefore, it's very apt for the Fulani caliphate to use the army to expand its territory, subdue the already “conquered south” and spread Saudi Arabia's Wahhabi Islam.